Hiring a professional rug cleaning company to deep clean one’s rug is one of the best things that can be done to prolong the life of the rug, and to keep it looking fresh and new. Many people are attracted to the low prices associated with do-it-yourself rug cleaning. However, in the end, only the professional rug cleaner can make sure your rug is being cared for properly. Optimally, the average residential rug should be thoroughly and professionally cleaned at least once each year, if not more often. The more often a rug is cleaned, the more unlikely it is to develop unpleasant odors or ground in dirt and stains. Additives can be used to protect rug from things such as bleeding colors or the browning that can occur over time. Rugs can also be introduced to stain resistant agents that are supplied by the professional rug cleaner. There are many things to take into consideration when hiring a New Jersey rug cleaning company. For example, the parents of small children or pet owners should always check to make sure the rug company that is hired uses spot treatment methods and cleaning fluids that are safe for children and pets. 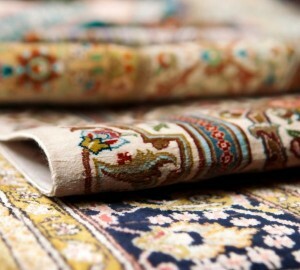 Toxic chemicals left in rugs can be dangerous to both. When people buy rugs for their homes, the manufacturer usually makes recommendations for cleaning. There are certain types of vegetable-based dyes that can respond to cleaning fluids, steam and various solvents used by professional rug cleaners. If one’s rug is still under warranty, it is important to follow these recommendations in order for the rug to be covered under the warranty. Therefore, it is important to hire a professional rug cleaning company that knows how to work around these issues. In New Jersey, professional cleaning service certification is conducted by the Institute of Inspection Cleaning and Restoration services. High Quality Carpet Cleaning, LLC. is a certified and reputable rug cleaning company. High Quality Carpet Cleaning, LLC is a well established company that has been in business for many years. As such, we have developed the expertise to solve any rug-related cleaning issue that might arise. Using state of the art equipment, High Quality Carpet Cleaning, LLC, can clean anything from rug that has been damaged by flooding, to those stubborn wine stains. High Quality Carpet Cleaning offers an excellent 24-hour emergency service for those unexpected mishaps that can spring up out of the blue. If you are considering hiring a professional rug cleaning service, visit us today and set up a free consultation for a representative to come into your home and give an estimate of the costs associated with having your rug cleaned professionally. High Quality Carpet Cleaning is happy to answer any questions a consumer might have regarding the various chemicals, cleaning procedures and any other questions the customer may have.